No Marty hasn't become a New York City cabby, this is actually an ad for New York-based fashion brand Nooka. Designer Mike Lubrano imagined converting a flux capacitor equipped DeLorean into an iconic New York City yellow taxi cab. He says that the automobiles have ‘come to symbolize the future’ and communicate the brand’s ‘futuristic philosophy.’ Besides, where in Manhattan can you do 55mph? 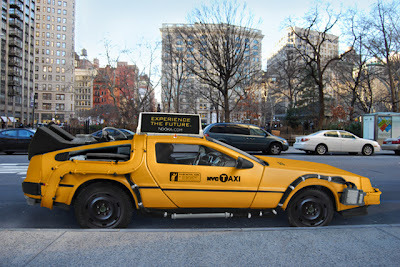 Just came across this...and sorry for being pedantic, but it's 88mph.